This is Ollie checking in from my forever home. I know it’s been a while since you’ve heard from me, so let me bring you up to speed! You might recall me from my early pictures when I was a scared, skinny boy. The kind people from CPR rescued me from a closed-down pet store in Miami. I was in a crate most of the time and didn’t get much to eat, but CPR took me in and loved me. 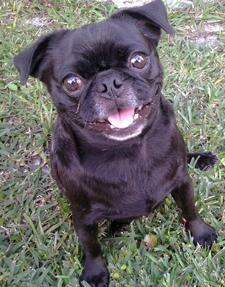 Soon, I learned to relax, eat healthy food, and I began curl my tail again in trust, as a happy pug should! Now, at my forever home, I have a nice gated back yard, so when I feel the need for speed, I run on the grass with my ears flying back in the wind. It’s one of my favorite things to do! I love people, I passed my first level of obedience training, and I love to eat, like any young man would! Next I’m gonna ask mom and dad for the car keys, ‘cause I like going for a ride every now and then too!